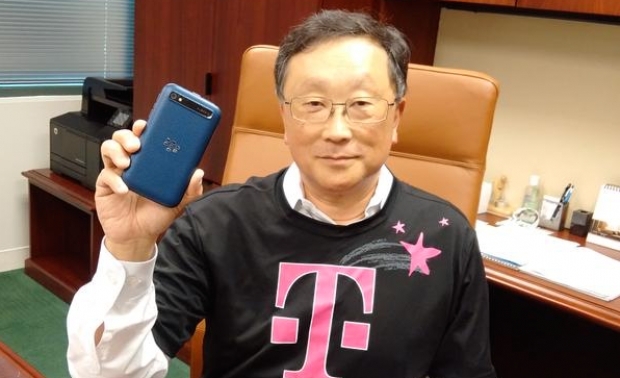 John Chen takes to Twitter to celebrate T-Mobile's BB Classic launch | BlackBerry Blast! BlackBerry and T-Mobile settled their recent dispute and T-Mobile is now offering BlackBerry again. BlackBerry CEO John Chen took to Twitter to celebrate the BlackBerry Classic on T-Mobile. Chen tweeted a photo of himself wearing a T-Mobile shirt and holding a BlackBerry Classic. I guess a picture is worth a thousand words. The tweet simply read, ". @JohnLegere Black & Magenta together #BlackBerryClassic Un-Leashed @TMobile today http://www.t-mobile.com/cell-phones/blackberry-classic.html � "
You can head over to T-Mobile to pick up your BlackBerry Classic.